Lymphoma has two major subtypes, Hodgkin’s lymphoma and nonHodgkin’s lymphoma, and accounts for approximately 13 % of childhood cancer. The 2008 revision of the World Health Organization classification system is currently used to define subtypes based on immunophenotypic characteristics. Virtually all anatomic areas may be the primary site for this malignancy, and the clinical presentations are protean. Hodgkin’s lymphoma occurs in nodal groups and tends to follow an anatomic progression. NonHodgkin’s lymphoma occurs in extranodal tissue and has a wide variety of clinical symptoms. The surgeon serves an important role in recognizing the potential for this diagnosis in all cases of undiagnosed soft tissue mass and in obtaining a properly handled specimen for pathologic examination. 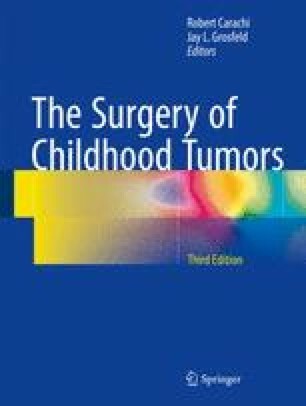 Preoperative evaluation for the presence of a mediastinal mass is of particular importance in all children with suspected lymphoma due to the risk of cardiovascular collapse with general anesthesia.